Home | Resources | Teen Drinking | What Is Binge Drinking? Binge drinking is common among teens, particularly when they begin to attend parties and experiment with new social surroundings. Binge drinking occurs when a person drinks a high level of alcohol during a short period of time. 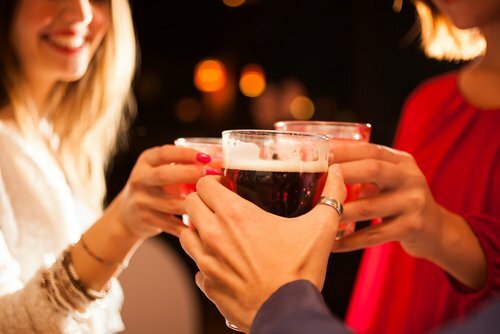 Blood alcohol levels reach 0.08 grams percent or higher when a person binge drinks—typically after 4 drinks for women and five drinks for men in two hours, according to the National Institute on Alcohol Abuse and Alcoholism. This pattern of drinking is common in teens and young adults, however the majority of the population that binge drinks are 26 years and older, according to Centres for Disease Control and Prevention. Binge drinking is very popular among young college students, especially those who are away from home for the first time and experiencing a new sense of freedom, independence and thrill-seeking adventures. It is dangerous to drink high volumes of alcohol in short periods of time, and participating in such activities can cause major health problems, including alcohol poisoning, brain damage, liver disease, intentional and unintentional injuries, and drunk driving. A recent study released by the American Journal of Psychiatry found that binge drinking can alter a teen’s brain development. Drinking what teens consider to be “normal” levels of alcohol has a lasting affect on the area of the brain responsible for learning, emotional development, and self-control. Before your teen goes to a party or off to college, educate them on the dangers of binge drinking and how to say no if they find themselves in a pressured situation.